Motorists passing through expressways will be paying a higher toll, inclusive of the 12 percent value added tax (VAT), effective October 1. The Toll Regulatory Board (TRB) gave the go-signal on Thursday to the country’s toll road operators to charge the new rates despite protests from commuter groups, mass transport leaders and lawmakers. The Bureau of Internal Revenue (BIR) expects to collect an additional P2 billion a year from VAT on toll. The new TRB notice approving the new rates was published in newspapers yesterday. The adjusted rates for all the country’s highways were also made public. The notice will be published again next Friday and again a week later in compliance with the government’s three-week publication requirement for any adjustment in the rates. At the North Luzon Expressway, the toll for class 1 vehicles from Balintawak to Sta. Ines will go up to P218 from the current P195. The toll will go up to P544 from P486 for class 2 vehicles and to P652 from P583 for class 3 vehicles. At the Subic-Clark-Tarlac Expressway, the toll from Tipo to Tarlac will go up to P272 (from P243) for class 1, to P543 (from P485) for class 2, and P815 (from P728) for class 3 vehicles. At the South Luzon Expressway, the toll from Alabang to Calamba goes up to P96 (P86) for class 1, P192 (from P172) for class 2 and P288 (from P258) for class 3. At the Metro Manila Skyway, rates from Merville to Alabang will go up to P164 for class 1 (from P147), to P329 (from P294) for class 2 and P493 (from P441) for class 3 vehicles. Toll at the Southern Tagalog Arterial Road (Star Toll) from Sto. Tomas to Batangas for class 1 vehicles will climb to P67 (from P60), to P134 (from P120) for class 2 and to P200 (from P179) for class 3 vehicles. At the Manila-Cavite Toll Expressway project, also known as Coastal Road, rates for the section from Roxas Boulevard to Longos, Las Pinas, will climb to P24 from P22 for class 1, to P48 from P43 for class 2 and to P72 from P65 for class 3 vehicles. to P129 from P116 for class 2 and to P194 from P174 for class 3 vehicles. The adjusted rates for all toll roads are rounded off to the nearest peso, to avoid forcing operators to give change in centavo denominations. 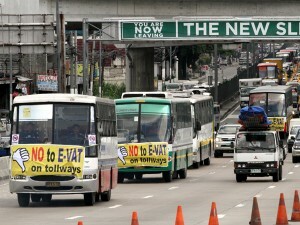 Despite TRB’s approval of the higher toll fees, oppositors are not yet giving up. Elvira Medina, head of the National Council for Consumer Protection (NCCP) said they would appeal to President Aquino together with other parties opposing the VAT on toll. “We’re not giving up. We will fight this measure until the very last day,” she said in an interview. “There’s still a possibility that the President will stop this,” she said. She warned that imposing VAT on toll would lead to higher public transport fares, which may force people who live in nearby provinces to relocate to the already-congested Metro Manila, instead of commuting everyday to get to work.